Join us for the monumental Lighting of the Sundial Bridge. To honor and raise awareness for everyone living with epilepsy. 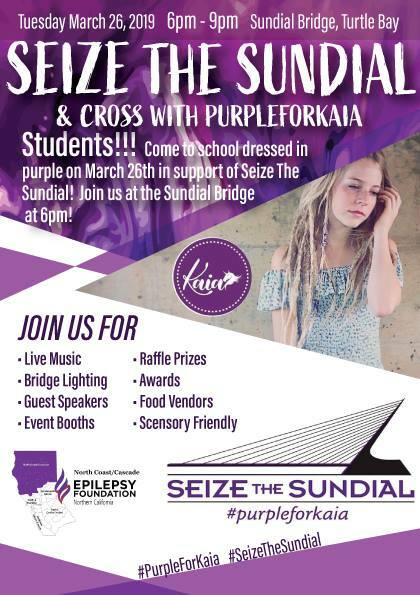 We invite you to join us at the 1st Annual Epilepsy Youth Awareness Event as we light the Sundial Bridge Purple on Tuesday, March 26, 2019 at 6 – 9 PM. Come and cross the bridge with Kaia and everyone supporting epilepsy! We’re addressing a critical issue that affects many people. Our mission is to spread Youth awareness and raise money to help support our mission. We created this event for everyone to contribute at various impact levels. Be sure to review the ways you can make an impact and please share this page with your family and friends. Contact our Youth Awareness Advisory Chair, Rita Davis to find out how you can become a sponsor or volunteer. Great sponsor package options available to choose from. CLICK HERE for our Sponsor Letter. We encourage you to support and Donate. We’ve provided multiple methods to donate. If you’re more comfortable using a GoFundMe Account, Rita has set up one HERE. Don’t Forget! Ask about how you can support Kaia’s Seizure Dog. CLICK HERE for fundraising details.